Dr David Adlam, who is leading the UK SCAD research project attended the Second International FMD Research Network and SCAD Symposium held in Cleveland, USA on 18 and 19 May. 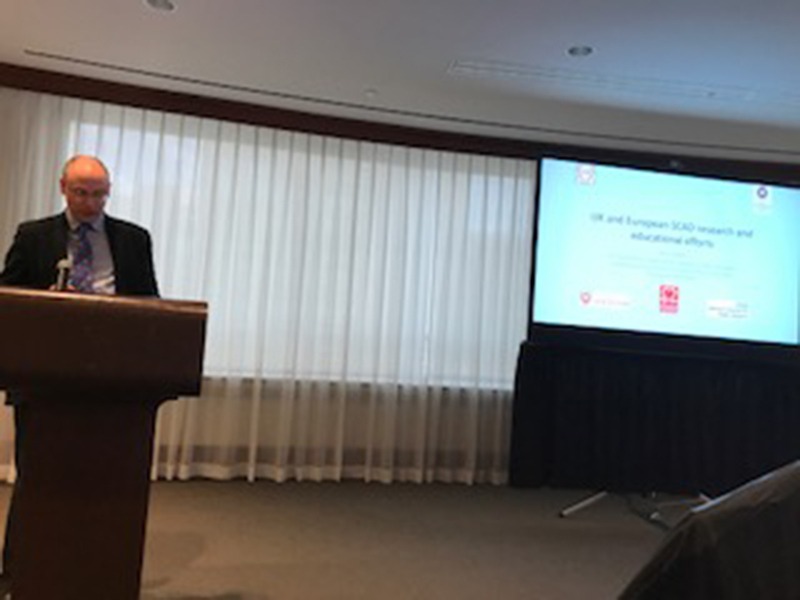 Some SCAD patients are also diagnosed with Fibromuscular Dysplasia (FMD), a rare connective tissue disorder, and the meeting brought together leading FMD and SCAD researchers, clinicians and patients to review current knowledge and research in the USA, Canada and Europe. Dr Adlam said: “The meeting was attended by many of our key US and global SCAD partners: Dr Sharonne Hayes and Dr Marysia Tweet from the Mayo Clinic, Professor Jacqueline Saw from Vancouver, Professor Robert Graham from Australia, Dr Malissa Wood from Massachusetts General and Dr Esther Kim from Vanderbilt. Patient representatives included Katherine Leon from SCAD Alliance. The symposium also included presentations in which patients talked about SCAD and FMD from their perspectives. We look forward to hearing more over the coming months. Dr David Adlam presenting at the symposium. Thanks to Pam Mace at the Fibromuscular Dysplasia Society of America for the photo. For more information on FMD please visit the FMDSA at www.fmdsa.org.